It's hard. I want to be home so badly. Consquently part of me wants to sit somewhere and be miserable, but the other penny pinching part of me doesn't want to waste time and rescources sitting around feeling sorry for myself. Jim says he's doing fine with the kids, and I talked to and saw them on google hangouts today so that helped...a little. Its different being in Edinburgh after a week of crawling through castles, churches and museums all through Scotland. It was like getting a crash doctorate (Andria and I keep testing each other, we may or may not know the Scottish monarchy almost as well as all of the US presidents). Now when I see things like the sign "Flodden's Wall" I don't just see a sign tacked onto an old stone wall, I can picture Queen Margaret's room at Lenlithgow. I remember sitting on the floor where she sat waiting and waiting for her husband (King James the IV) to come home (he didn't). When I was here last Saturday, I took lots of pictures of the actual physical city. This week I took more pictures of life in the city so one could see how crazy it is to see modern people living in a city that looks like a time machine. During the Jacobite years (Outlander) the castle housed the biggest cannon you have ever seen (it's there now, having been returned recently from London). Bonnie Prince Charlie took the town and Holyrood Palace from the English, but couldn't take the castle on the hill. After the rebellion, the townspeople lived in holy fear Big Brother would come crashing in (literally) if they stepped out of line. Living in San Diego I can't imagine waking up every day to that silhouette watching over the whole city (and I say that as someone who loves the castle). These are the Scotsman steps. If there's one thing I've learned it's that the Scottish people like to discuss everything at great length. These marble stairs were a compromise that connected the old city with the "new" city (which is now also very old). There is no end of things to do in Edinburgh so we rallied forth this morning and set out to drown out our woes in bigger things that reminded us of the grand scope of time and God over small things like airlines and storms. And that's how we ended up at the Scottish National Art Gallery. Now I'm not really an "art" person. I try to appreciate it, and I do better if someone is around to explain it to me, but the written word is my poison of choice. I'd much rather be in a stuffy garret somewhere with Jamie and a printing press (this one printed Ivanhoe and Waverley!) than in a salon somewhere with a paintbrush. We've been many times to the art museums in San Diego and LA, so I was expecting something similar. So imagine my shock and surprise when the first painting is a Rambrandt, and the next one, and next one...and next one is too. There's Bottecilli...Raphael...everyone. THE REAL THING. And they aren't behind glass and the frames are real and cracked. There isn't a line you have to stay behind without someone in a uniform barking at you to stay back. You could almost put your nose on THE ACTUAL BRUSH STROKES of Gainsborough and Durer. Maybe this is not big news to anyone who's been to the Louvre? (I have no idea) But it felt insane. I also was familiar with a lot of the halls, palaces and places they once hung and for what people. It truly was like looking at the world as though it was happening right in front of me in the 1500's or whatever. I now have a small list of copies I need to hang in my house (Lisa, help?). 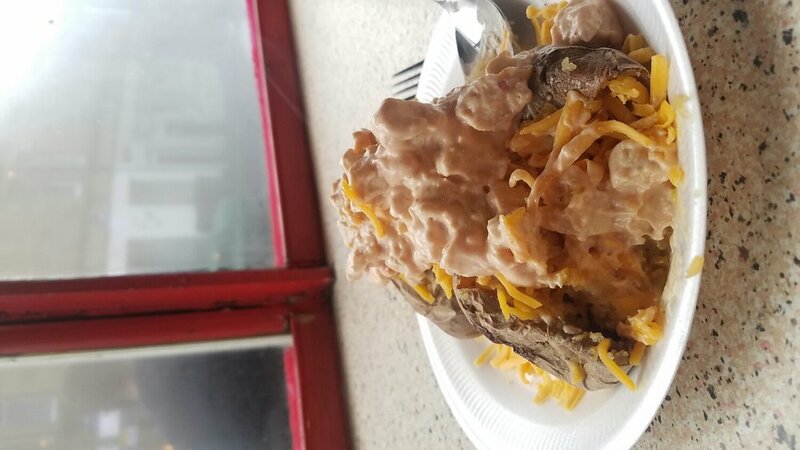 There was one thing I didn't get to try (food wise) this trip and it was baked tatties (potatoes). They're everywhere and on almost every menu, but they have ominous words like "mayo and chippers" next to them which makes ordering one a bit risky. So when we left the art museum I googled "best potatoes in Edinburgh" and it took us to a place called "Tempting Tatties". It was like Subway for potatoes. The server was patient with us as we painstakingly tried to figure out what all of the mystery toppings were. I got some sort of chicken chili thing that he claimed was spicy but was in actuality less spicy than Doritos. It was amazing. I spent a lot of my childhood (and current life) eating baked potatoes for breakfast with whatever I can find in the fridge thrown on top, so this was my happy place. I could eat there breakfast, lunch and dinner as long as I got an occasional bowl of soup thrown in. It was in between lunch and dinner, so our server kindly chatted with us the whole time and gave us directions to the Water of Leith Walkway. It was more like Wonka's chocolate river (and flooded) which made navigating the walkways a bit tricky but fun (and it flows through the heart of the city!). All in all it was a lovely (if a bit introspective) day. There was also a rugby match between Scotland and Wales and it literally felt like we were in the World Quidditch Cup with Ron and Harry. And yes, they do just randomly break out into lusty song here.